Matcha is a special type of powdered green tea that usually comes from Japan. The green tea leaves are shaded from the sun for the last few weeks of their growth, increasing the chlorophyll content and creating a gorgeous green color. Then, the leaves are carefully ground with stone grinding wheels to produce a fine powder. You then use the powder to brew frothy green tea or in recipes like smoothies or baking. Unlike other types of teas, the green tea powder is not strained out before consuming. You are therefore consuming the entire leaf. 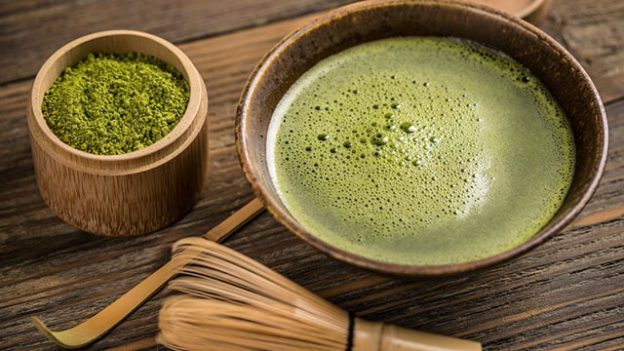 This makes Matcha up to ten times stronger than ‘ordinary’ green tea. It promotes a feeling of calmness. This is because it contains the amino acid L-Theanine. Zen Buddhist monks drink this tea before meditation. It improves your cholesterol levels. Regular consumption of Matcha Green Tea can lower LDL (‘bad’ cholesterol) and increase HDL (‘good’ cholesterol). This can reduce the risk of heart disease by 10% or more. It detoxifies your body. The high levels of chlorophyll in Matcha Green Tea don’t just give it the trademark rich green colour. They also help to naturally remove toxins and heavy metals from your system. It has a high level of antioxidants. Green vegetables, raw fruit, and dark chocolate are all renowned as being high in antioxidants, but Matcha Green Tea has more than them all. It has a particularly high level of EGCg catechins. These are the most powerful and beneficial antioxidants. Matcha Green Tea powder typically contains 60% EGCg. It helps to burn calories. It increases your metabolism, therefore helping the body to burn fat faster. It’s a great weight loss aid, in conjunction with a suitable diet. It boosts energy levels. Its combination of nutrients can give the same boost as caffeine in strong coffee, for instance, but without any of side effects. It helps concentration and memory. The L-Theanine in Matcha green tea produces chemicals, such as serotonin and dopamine. These chemicals improve memory, enhance mood and boost concentration. It improves your immune system. Matcha green tea powder contains potassium, iron, calcium, protein and vitamins C and A. Aside from these nutrients, this tea also contains antibiotic properties necessary for the promotion of overall health. It makes you feel good! Matcha green tea doesn’t require lemon, milk or sugar to add taste, since it already has its own savoury flavor. Drinking this wonderful tea that is all natural, without any undesirable components not only makes you feel good, but is also beneficial for your overall wellbeing. At Evolv, we stock Matcha Green Tea from some of the leading brands. Why not call in to learn more? We might even brew up a sample for you!